My all-time favorite decorative accent in interior design is… metal! Just about every wall in our home that has something decorative on it has at least one metal accent. 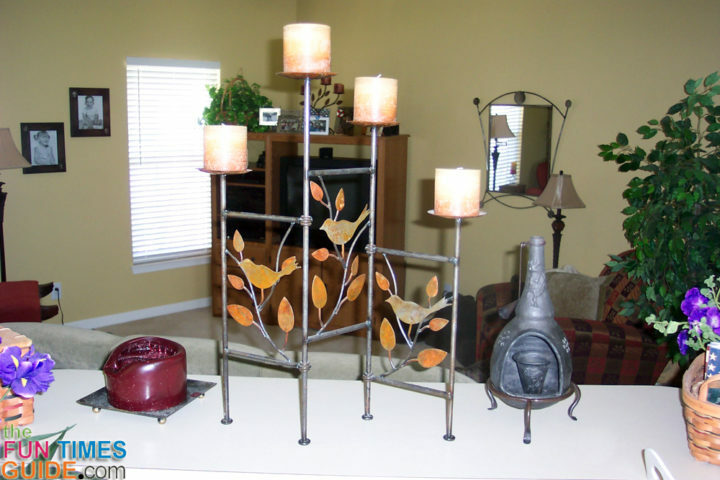 Metal is just so rustic… and bold… and adds another dimension to home decorating. It’s not flat and 2-dimensional like most other aspects of art and home decor. Metal is 3-dimensional and adds a solid, timeless feel to the space. Following are some of the metal-accented pieces of art that have made their way to the walls inside my home. My newest addition is this 3-piece metal flowers wall art display. I got it from Uncommon Goods. 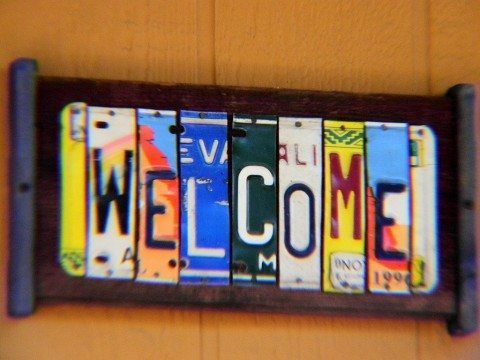 It’s usually the first place I go when I’m looking for unique — often handmade — home decor items. I’ll be honest, I thought each of the flowers would be a bit larger than they are. Even though the dimensions are clearly stated (6″ x 3″ and 1″ deep), my brain just didn’t register how small they would actually be. Still, they’re a sweet accent for this space between our master bathroom and our walk-in closet (his stuff is on the right, my stuff is on the left). I like the fact that they’re handmade, so no 2 are exactly alike. And I also like that they’re shiny (or rather, glossy) and metallic — so you get two cool textures in one wall display. Even though they have a good bit of weight to them, I was able to hang them without nails! 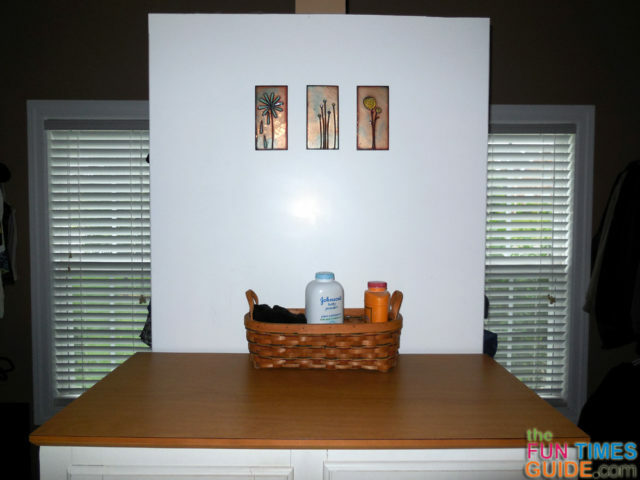 I used UGlu which is completely removable and doesn’t leave nail holes behind. My second recent addition is this custom metal license plate sign. This piece of wall art is rustic and a little rough around the edges — which is exactly why I like it. The phrase and the state license plates commemorate an adventurous motorcycle trip that my husband and I while exploring the original Route 66. You can choose the word or phrase, even the colors, and some other details when you speak with the designer before ordering. I got the multiple mirrors piece (where each mirror is encased in a black metal circle) at Kirklands. They have a great selection of unique wall art. I usually visit the store whenever I have a coupon, and I frequently check their limited time offers online. The other wood-framed piece seen in the photo above has a completely metal interior, and I can’t remember where I got it from. I’ve had it for years — if not decades! 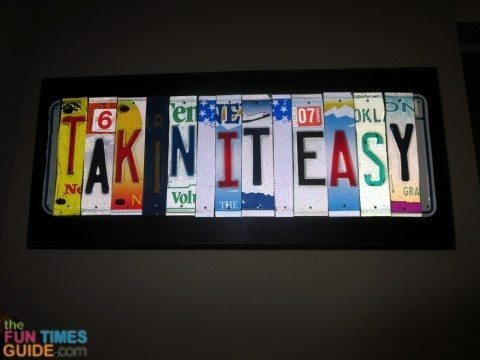 I adore the personalized framed letters that spell out our last name. We got it as a gift from our realtor. He gave it to us on the day we closed on our house. He said it was made at a local novelty store here in Nashville. Of course, you can also find these types of framed letter signs on Etsy. Or you could just make one yourself! I added 2 metal candle sconces to the wall — one on either side of the framed art — to bring more attention to this lovely piece of artwork. Here are 2 other metal candle sconces with mirrors that I have on another wall in the house. 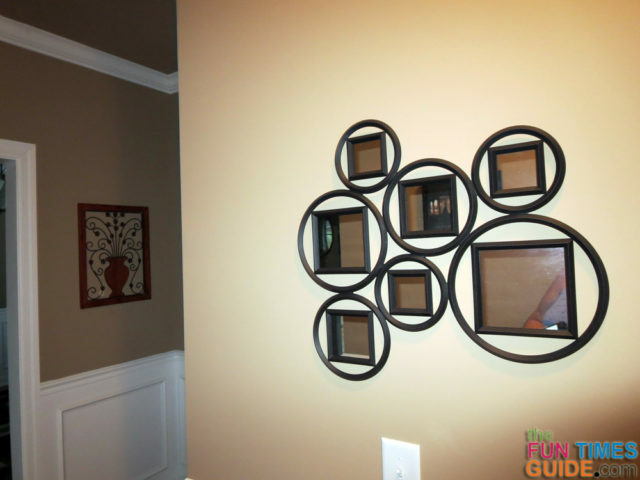 Speaking of mirrors… I really like this uniquely shaped metal-frame wall mirror. It has survived several moves from house to house, and has been used in several different rooms through the years. I got it at Bed Bath & Beyond a long time ago… with a coupon of course. Psst… don’t forget, they let you use up to 5 coupons per checkout (1 per item) and the coupons can even be expired. If you’re like me, you’ve got a nice collection of BB&B coupons saved up. If you haven’t already done so, I would encourage you to get on their mailing list so the coupons keep coming! 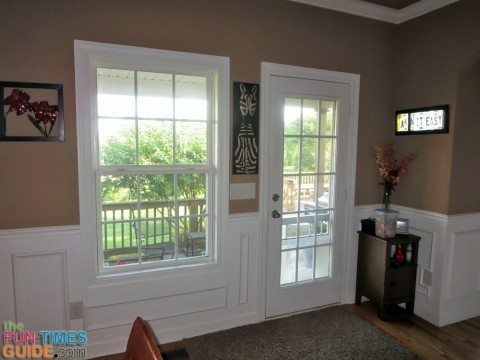 You’ll notice in the above photo that there’s another interesting metal object on the mantel above the fireplace. That’s a 4-tiered metal candle holder that has also survived many moves and traveled with me from house to house. To prevent my entire house from being decorated entirely in metal, I also look for wall art that’s made of something else but has tiny metal accents — like this painted canvas wall art which has a small amount of metal scroll work along the top. Since I purchased both of these wall art collections at separate times and from different stores, it was a nice surprise to see how well they work together! The metal flowers candle wall sconce I’ve had for years. I got it at Trees ‘n Trends. The 3-piece metal cut-out flowers arrangement I got at Kohls. For the longest time, I had them in different locations — until one day it dawned on me how great they might look together. Wah-lah! They almost look like they’re all part of the same set. 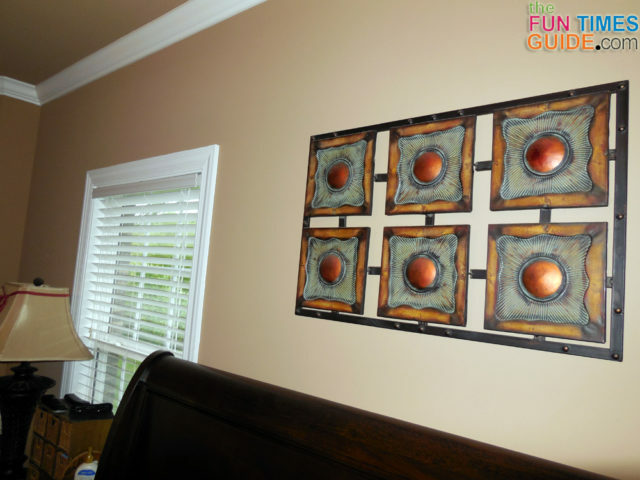 We even incorporated a few pieces of metal wall art in the bedroom as well. This next one — a multi-colored metal wall art hanging in earthtone colors — I liked so much, I bought 3 of them! I got it at Kirklands. Every other colored metal piece has a circular mirror in the center of it. It’s great because it’s the perfect combination of color and mirrored reflections. I put one as the focal piece in the foyer, so everyone who enters our house sees it. I still need to find ‘the right’ accent pieces for that same wall. I put another one upstairs, above the glass-top table desk. I gave the last one to my brother as a housewarming gift when he bought a new home. Finally, when the holidays arrive, I only add a few decorative holiday pieces around the house — like door hangers and a few rustic country-looking decorations. 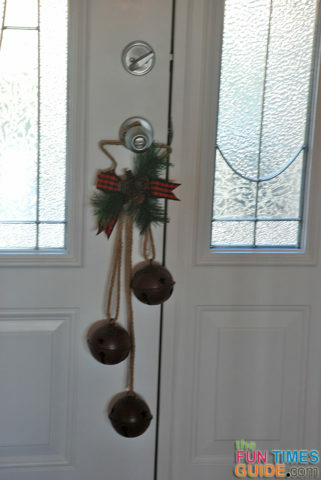 I like these rustic Christmas bells because of the mix of textures with the jute and metal. This 5-Bells Star Door Hanger is the closest I could find online. I got mine at Target a few years ago.